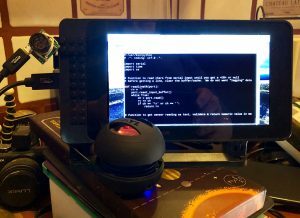 Home / Raspberry Pi / Replace that tennis ball with a talking Raspberry Pi! 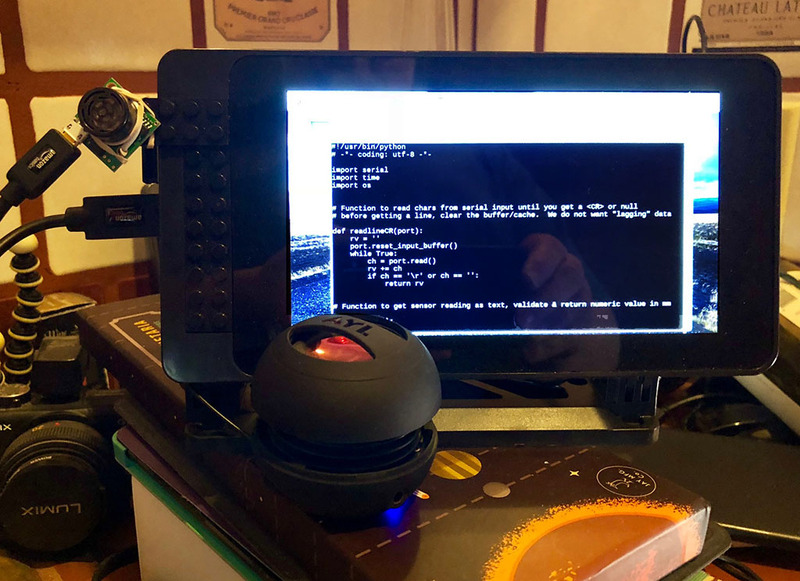 Replace that tennis ball with a talking Raspberry Pi! 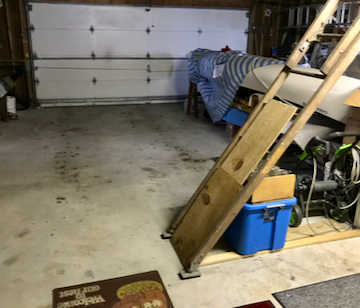 Our garage has a ladder sticking out near where we park our car. We want to park close to the ladder leaving enough room to walk in front of the car and also allow room behind the car for the garage door to close. 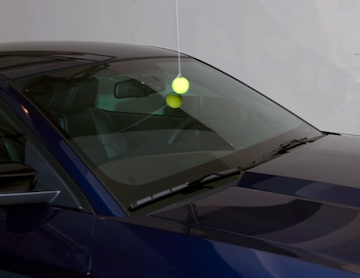 A typical solution to this need, and one we’ve used in the past, is to have a tennis ball on a string positioned such that the car window nudges the ball and shakes the string — so you know when to stop. A great analog solution! I, however, desired a digital solution that incorporates a Raspberry Pi. 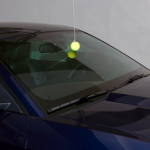 This parking-assist solution doesn’t “speak” to me! So, what is needed to pull this project off? 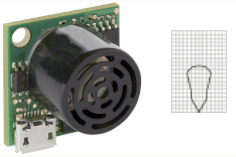 A real time distance-measuring device that interfaces to a Raspberry Pi, software to convert values (measurements) to text, software to “read” the text (text-to-speech), and hardware for audio output. I decided to program my application in Python as all the pieces I needed could be accessed via various python libraries or by calling-out to the operating system for helper applications. I decided on the pySerial 3.x module for serial communications. I also installed the “minicom” Linux terminal application, which enabled me to talk to the range sensor for setup and testing. The sensor communicates via the USB port in a stream of ASCII text numbers. Python provides the ability to maipulate strings and convert numbers into various units of measure (inches, feet, cetimeters, meters, etc.). I wanted values and commands (“vehicle detected … 3 feet … 2 feet … 1 foot … stop!”) to be spoken. To do this, I needed a text-to-speech (TTS) utility. There is a nice comparison of different TTS engines that run on the Raspberry Pi on eLinux. After some research and experimentation I went with “pico2wave”. I found this to produce the most natural speech — and it supports multiple languages. As pico2wave outputs a “WAV” file, I needed another app to convert the WAV file into audible output. I used “aplay”, a Linux command-line soundfile player. Need to determine which USB port is being used. Look for “tty” entries with “USB” suffix. Compiled on Apr 22 2017, 09:14:19. The “R” indicates a range reading and the number is the distance from the sensor in milimeters. As you move things closer or further from the sensor, you’ll see the distance number change 🙂 You can exit terminal mode with CTRL-A followed by “x”. Now we have the raw data that we want to manipulate. I want to convert to imperial units (inches, feet, yards) for us Americans and I want the R-Pi to talk. I am using Python 2.7 which is installed as “python” on the R-Pi. Do not confuse with Python 3.5 (“python3” on R-Pi). If you have your R-Pi setup for audio output, you can test things by using “pico3wave” and “aplay”. I’ll leave it as a user exercise to ensure “aplay” is outputting to the correct device and that TV or amp/speakers are connected correctly. The use of “aplay”, from the ALSA framework, over “omxplayer” allows for more output devices such as USB powered speakers, DACs or other USB audio devices. pico2wave -w sorrydave.wav "I'm sorry Dave. I'm afraid I can not do that"
I integrated the various pieces (sensor readings, text-to-speech and audio output) via a Python program. I used the serial input library, did some measurement conversions and used system call for TTS output. There are a couple of areas to note in the code. MaxBotix suggests using the median of multiple readings to reduce “noise” and spurious measurements. I also don’t want the R-Pi always talking! I check to ensure an object (my car) is within 1800mm (6 ft.) and that there has been some movement since the last reading (use of “delta” variable). I believe that there are many use cases for being able to measure distance, detect motion and have the R-Pi speak. Please LMK if you build this “parking-assist” system or if you develop other uses for the concepts presented here. 4 Responses to Replace that tennis ball with a talking Raspberry Pi! Have been asked if code and hardware works with a Raspberry Pi Zero W.
Hi! Nice tutorial! I created this a while ago, but never did anything with it. This weekend, I borrowed some BlinkyTape lights from a friend and incorporated them into this project, instead of using the voice to tell you how far away. I set a simple if/else statement to set the correct color based on the distance. Only other thing I changed was reduced the delta to a smaller value, so that it would react quicker. I’m sure there’s more tweaking to do, but this seems to be working for now. One thing is the lights are always on. Might be worth adding a timer to turn the lights off if some amount of time has passed with no movement.